Does the film industry have a woman problem? From the outside it may not seem so evident, but when you look a little closer, and start to read more articles from people inside the industry about how it is biased toward females from almost every angle, you start to become a little depressed. Don’t worry, we believe the more celebrities and film industry executives raise their voices about these problems, and the more the media shares these messages, collectively we will chip away at the issue. Audiences are not the problem, it is clear they are more than happy to spend their dollars on films featuring female protagonists such as ‘The Hunger Games’ (the first and second installments of this franchise were the highest selling films at the box office in 2013 and 2014) or those directed by women such as ‘Pitch Perfect 2’ (directed by Elizabeth Banks which in its first weekend outsold the first installment, and beat the ‘Entourage’ film at the box office which was released that same weekend – NBD). There are so many women in Hollywood determined to change the uneven statistics when it comes to female representation in the film industry. And we’re not just talking about on-screen either. In fact that is probably the least of the problems at hand. It all starts at the top. If the majority of executives, producers, directors and writers are men, do you think they are going to be able to write stories featuring complex female protagonists 50% of the time? Of course they’re going to be better at writing roles and films for men. It’s not the fault of these men either, as Geena Davis, creator of the Geena Davis Institute on Gender in Media and the Bentonville Film Festival, has said in an interview before. It is the system that was set up to favor men decades ago when they did make up the majority of the workforce, and has remained to this day because it makes money and it works. Now that we are beginning to see that films made by and starring women ALSO make money, it is time to change the system. It will take both an academic and practical approach. From an academic standpoint, it is about seeing where the inequality stems from, and understanding the statistics. One woman who has taken this road is British actress, designer and producer Sadie Frost. She has been in the film and fashion world for quite some time, having worked with her ex-husband Jude Law on a number of films, and also creating her own clothing line Frost French. She recently completed a Masters Degree where she researched the sometimes difficult careers of female film-makers. After her studies, she embarked on producing a film out of her production company, Blonde to Black Pictures, called ‘Buttercup Bill’. As a result of some of the difficult issues she learned of during her studies, she deliberately set about ensuring 80% of this film’s crew were female – that in itself is almost unheard of in the film industry! One of the of the biggest factors affecting female filmmakers was having a family. “For the MA I interviewed some top female producers about how being a mother and a woman affected their careers. Some said it doesn’t make any difference if you’re a man or woman. Others said: ‘It’s absolutely affected my career and the decisions I’ve made’,” reported the Guardian. “Yes, things have changed. But the fact is, if you are a mother and you maybe have one or two children … you’re less likely to go on and do a second or third feature,” she added. It’s unfortunate that we live in a world where in many areas, women are forced to choose between a career and having a family, and no matter which route they choose, there is criticism. Sadie has 4 children with ex-husband Jude Law and after taking a break after the birth of their first at age 24, she was told she was “too old” and would never “make it” because she chose to take time off. Part of her new perspective includes helping women break out of the stereotypical roles they occupy in film, and allow them to be seen as equally represented in more typically “masculine” roles like producing and directing. A report out of Britain last year revealed that women accounted for only 23% of crew members on the 2,000 highest-grossing films of the past 20 years. Just 5% of the directors were women. In the UK women only account for 8% of directors in film and TV. In Hollywood, the numbers don’t exactly zoom toward equality. An eye-opening infographic shows that over the past 5 years, only 4.7% of films released by a major studio were directed by women. Interestingly, the role that women are best represented in behind the scenes is producing. A study by San Diego University found that women make up 23% of producers in Hollywood. How do these low numbers affect what we see on screen? “Film is a major way in which we talk about ourselves as a society. If we have a select group of people telling the stories, we are influencing our culture that way,” said Stephen Follows, the man whose British study we referenced above. Kate Kinninmont, Chief Executive of Women in Film & Television UK says the people who are in charge of what we see on TV and in film directly affect how we view the world as a result. “It is to do with people being aware,” Sadie Frost added, something which she has certainly become after her studies and her new-found mission. If we need any further proof that this is a battle even for women at the top of the A-list, take a look at some recent comments made by two very popular actresses in different mediums. 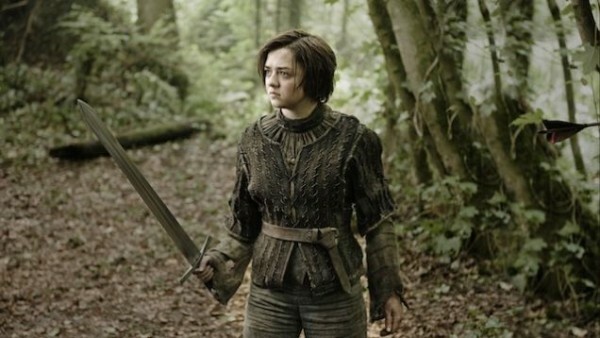 ‘Game of Throness’ actress Maisie Williams who plays the sword-wielding tomboy Arya Stark complained in a recent interview that there is a huge need for better roles for women. The 18 year old, who landed the role of a lifetime at the mere age of 12, says her experience so far in the industry has made here aware of the lack of interesting parts for women. “There are a lot of roles that come in that are ‘the girlfriend’ or ‘the hot piece’ in a movie or TV series. That’s something I’ve seen first-hand and read all the time. It will say ‘Derek: intelligent, good with kids, funny, really good at this’ and then it will say ‘Sandra: hot in a sort of cute way’ — and that’s all you get. That’s the way your character is described, so going into an audition you are channeling ‘hot’, which isn’t like a person, that’s not who a person is. That’s what I see and that’s what needs to change. I’ve been lucky enough to play a very great female character from a young age, who is a fantastic role model for girls,” she said. One of her solutions lies with actresses and the choice not to take those roles. Over in Hollywood, Academy Award-winning actress Sandra Bullock has also come up against this female character road block, and if Sandy’s feeling the heat, then we KNOW there is a problem! In an interview with Entertainment Weekly about her new film ‘Our Brand is Crisis’ where she plays lead character Jane Bodine who is a political strategist, she explained the unusual way she came to land this interesting role. “About two and a half years ago I put out feelers saying, ‘I’m not reading anything I’m excited about, are there any male roles out there that [the filmmakers] don’t mind switching to female?’,” she said. It turns out George Clooney and his producing partner Grant Heslov were developing a drama loosely based on the 2005 documentary called ‘Our Brand is Crisis’ which tells the story of a group of American political consultants hired by former Bolivian president Gonzalo Sánchez de Lozada to help him get reelected. The lead role of the political strategist was originally intended to go to George Clooney. After Sandy reached out to her old ‘Gravity’ co-star, him and his partner decided to flip the gender of the lead role and give it to her. If it’s that easy why doesn’t Hollywood do this more often? It’s yet another solution that the Geena Davis Institute has outlined as an easy way to change the ratio of roles that go to women in film. “Our conversation starter: Why the hell isn’t anyone writing decent (female) roles for Sandra Bullock?” asks Clark Collis at EW, and we’d also like to know the answer! So now that we have seen the effect of the academic point of view on Sadie Frost, as well as the practical perspective from Maisie Williams, Sandra Bullock and let’s be honest countless other women in the industry worldwide, we hope we start to see a huge increase in female writers, producers, directors and filmmakers.